the float bounced around within the glass container showing the status of the fuel supply. Hindsight has me wondering what happened to the gas in the event of an accident! But then, the speed of cars wasn’t what it is today. Also, bumpers on those cars were real and more structurally sound than the sheet metal fakes that exist today. On the older cars, the steering wheel post had two levers that disappeared many years ago with the improved engine designs. The first controlled the richness of the fuel-air mixture to the engine, providing a gasoline/air mixture from rich to lean to the engine. The other varied the number of degrees that the spark plug fired before TDC (top dead center). When a car was started, the fuel-air mixture was set at “Rich” and the spark was set close to TDC. 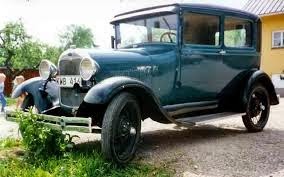 While the operator sat behind the steering wheel, a second person used a hand crank to “turn the engine over” from in front of the car. When the engine “caught,” the operator gradually shifted the fuel-air mixture lever from “rich” to as close to lean as he could and still keep the engine running without overheating. This step was taken to conserve fuel. Concurrently, the operator would “advance” the spark by moving the spark lever to increase the number of degrees the engine would fire before TDC. This step was taken to increase power. The movement in combination of the two levers permitted the operator to adjust the operation of his engine, and increase power while reducing fuel consumption. Ever lurking in the background was the possibility of the engine overheating if the mixture was too lean or the spark was firing too soon. over the abraded area to seal the patch to the tube. The repair would be clamped while it dried. 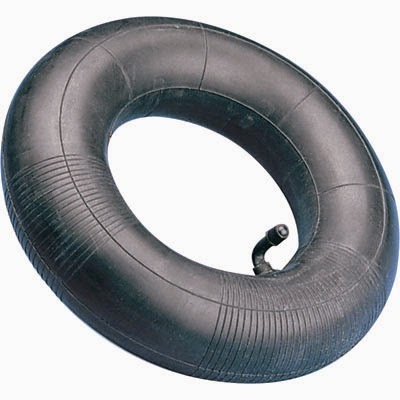 If the repair held, the tube was inserted in the tire with the tube valve facing the outside of the tire. 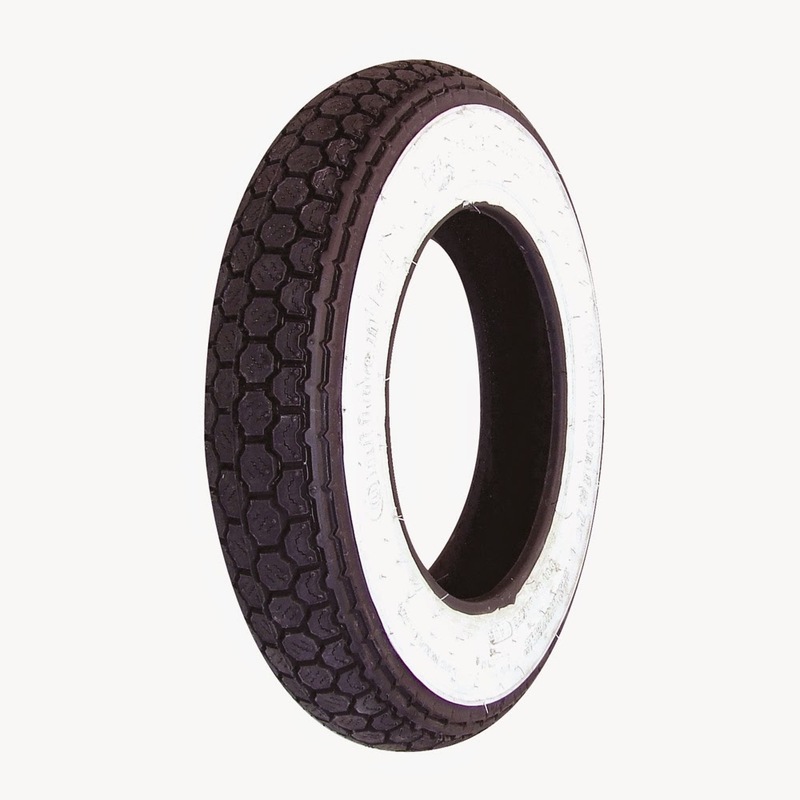 A hand air pump would be used to inflate the tire to the proper pressure measured with a cylindrical gauge. The hot repair kit provided the driver with a small disc filled with a combustible material which was clamped to the patch and set ablaze vulcanizing the patch to the tube. With the wheel replaced, the driver (who by this time was filthy dirty) cleaned himself as best he could and continued his journey. Some drivers included a wash-up kit in the trunk. Gas stations in rural areas were few and far between and the knowledgeable driver strapped a container of gasoline to the trunk, usually inside of one of the spare tires. 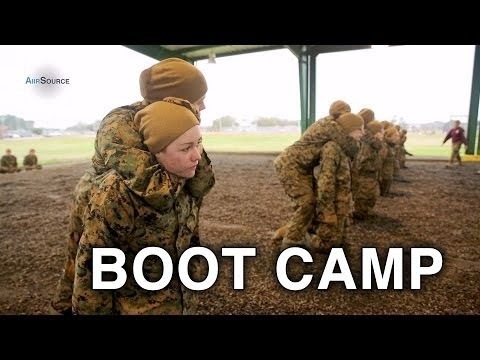 There are two Marine Corps Boot Camps used by the United States for the basic training of Marines prior to their attending specialty schools. 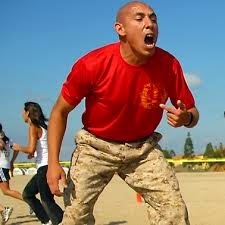 One is located at Parris Island, South Carolina and the other is in San Diego, California. 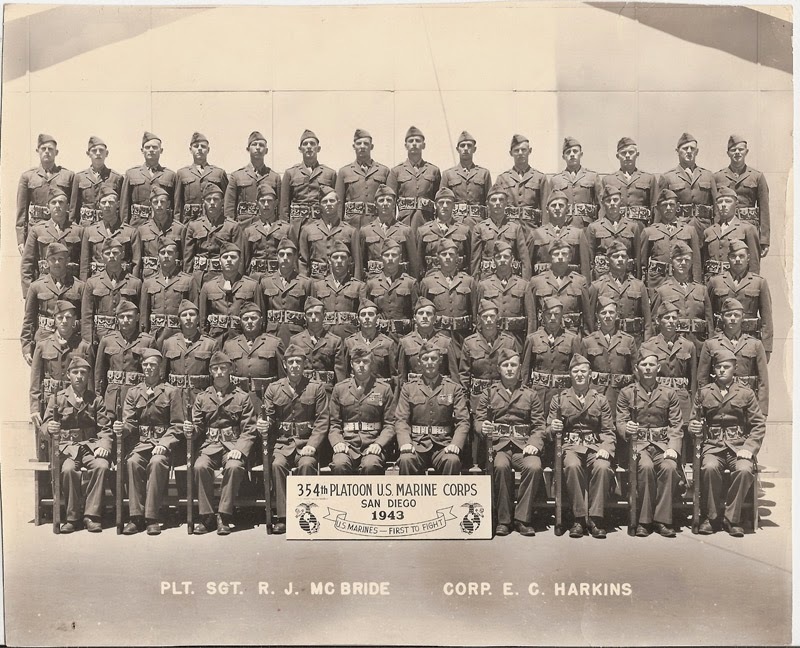 I attended Parris Island in the summer of 1941 and this essay reflects pre-war conditions as I remember them. 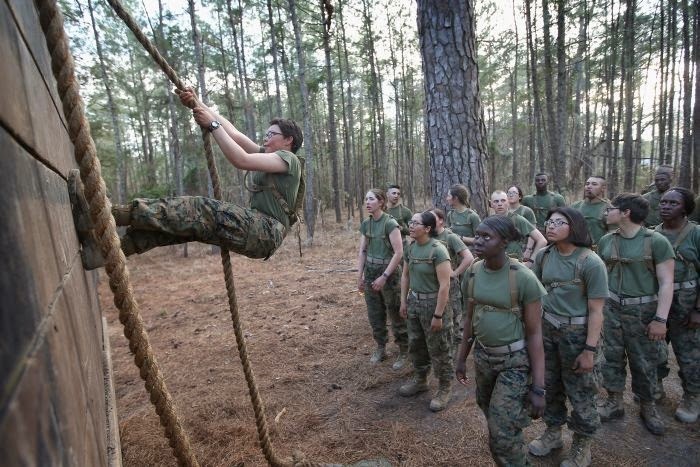 The routine for new Marine recruits, called Boots by the Corp, is simple enough. 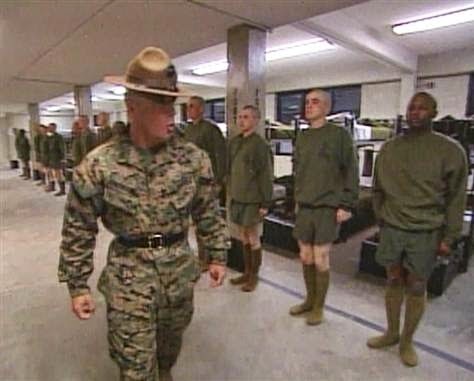 A platoon under the command of an assistant Drill Instructor (DI) is formed to collect incoming Boots until the platoon reaches its quota. During this early period the current members of the platoon are housed in a tent city with other forming platoons and do nothing until the platoon quota is reached, usually in 7-10 days. The assistant DI sees to the forming platoon receiving medical care, food and other necessities. My first meal at Parris Island was breakfast the morning following my arrival. The assistant DI marched us in our civilian clothes to the mess hall where we were instructed to stand behind long benches at equally long tables covered with trays and bowls of food. At the command Seats by the mess sergeant, all sat and had breakfast. The food was plentiful and varied. One large bowl was filled with what looked like a coarse Farina and, in all innocence, I asked the Boot seated next to me if he knew what the bowl contained. He looked at me as if I had two heads and explained thems grits, boy, thems good! I tried some with maple syrup, yech! It looked like wall-paper paste and probably tasted as bad. I had a good breakfast – but no more grits! I found out some time later that the Marine Corps back then was predominately southerners who ate grits as a normal part of their daily diet. 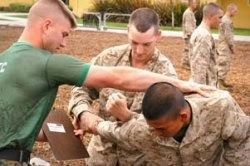 The time came when the platoon was filled and our training would start. Our DI, who would do the training, was scheduled to arrive the following morning. He arrived: A big, grim, steely eyed southerner, right out of a Hollywood film script. 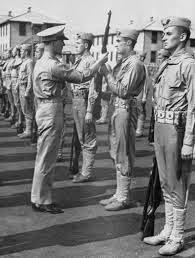 He came aboard, ordered the platoon onto four ranks and addressed the unit. 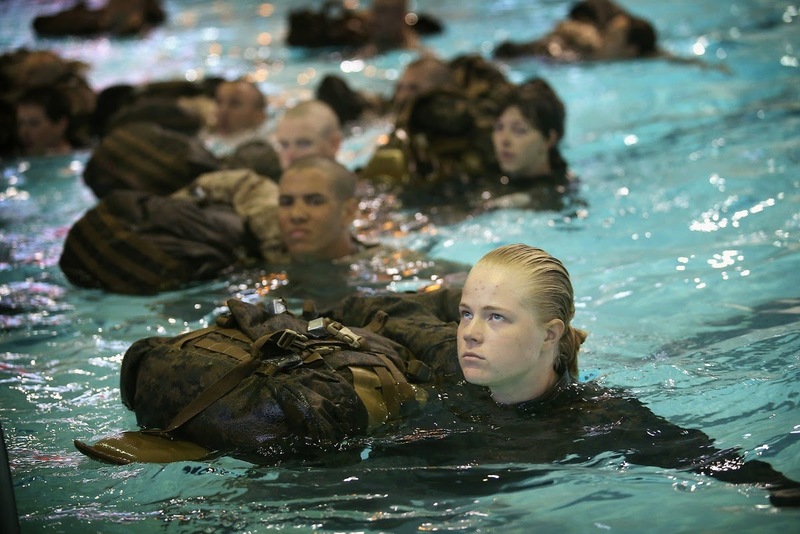 Training as defined by the Marine Corps is vigorous and designed to work all deficiencies out of the unit at Boot Camp and not in combat. Training continued for the designated weeks until it was time to go to the rifle range where we all found out what makes a Marine unique. We arrived at the range and immediately had the firing pins removed from our rifles. No firing pins, no accidents. We all had the Springfield in those days, a rifle which loaded with 5-round disposable clips. Training included learning the different firing positions and the use of the rifle sling. For the layman, the rifle sling is used to bring the seated or kneeling Boot into one tight solid mass with his rifle, such that wavering is eliminated or reduced to a minimum. It permits the Boot to get on target faster and, once there, to hold the rifle steady permitting more accurate and more frequent firing. The Springfield rifle used in those days was a very accurate single-shot weapon vastly different from today's rifles which fire automatic and semi-automatic rounds. All rifles were zeroed in by bore sighting and by adjusting the leaf sight to correspond to the weather conditions at the chosen target. No optical sights here. 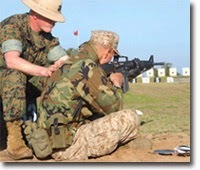 A properly bore sighted weapon provided the Marine with a rifle mechanically correct, leaving it to the Marine to develop the skills required to recognize and compensate for heat, wind and humidity. The purpose of the rifle range training is to develop those skills needed to achieve expert rifleman or sharpshooter skills or, as a minimum, to qualify in marksmanship. Failure to qualify in marksmanship will cause the Boot to be dropped back one platoon to repeat the training, something no Boot wants to experience. 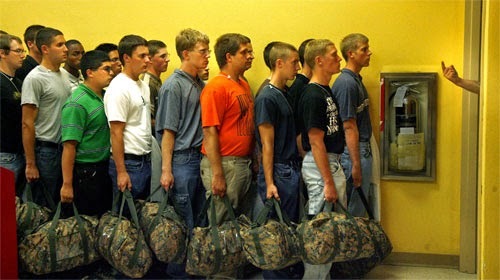 Repeated failure could be reason for being discharged from the Corps. It is a rare instance when that happens. The training methods are so advanced and intense that, on a regular basis, more Boots reach the expert and sharpshooter levels than just qualify. There is good reason for this. 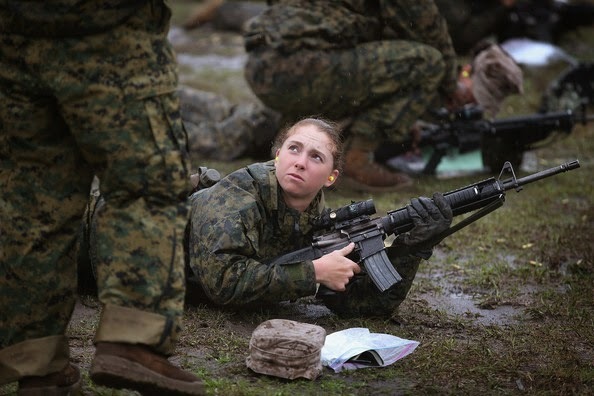 In the Corps a Marine is a rifleman first and always, regardless of assigned specialty task. 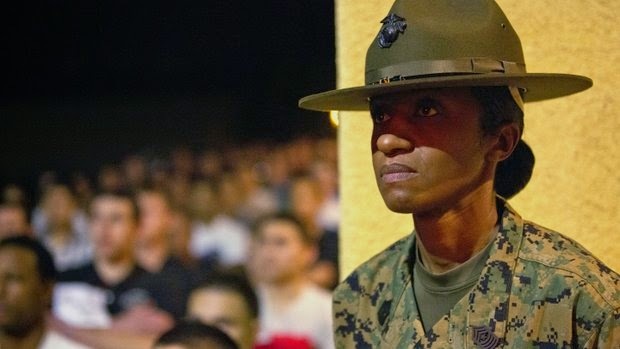 The Corps stresses high marks- manship to the point where experts and sharp- shooters receive additional monthly pay for a year with the opportunity to compete for a continuation of the extra pay for following years. 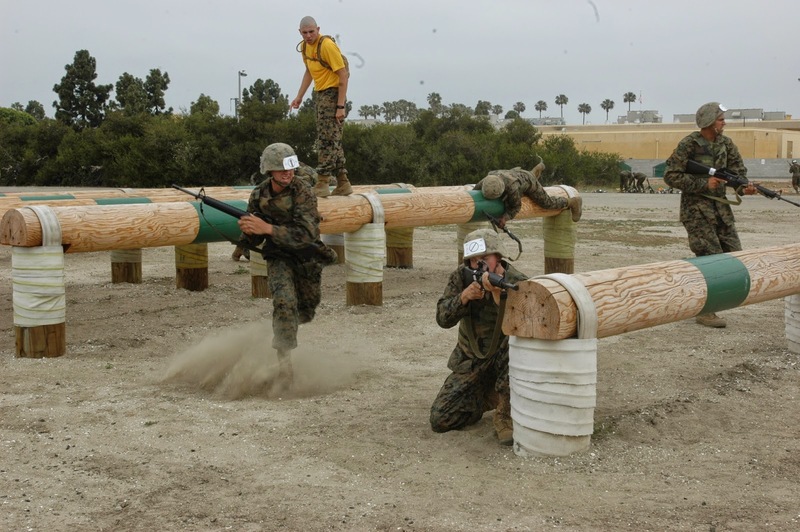 Competition for the expert and sharpshooter badges is fierce among Boot and Marine alike! the highest possible qualifying score on record day. He works with you on a one-on-one basis ever correcting faults you may have that could affect your score. The two DIs are assisted in this task by a staff of instructors who are specialists in the proper use of the rifle. 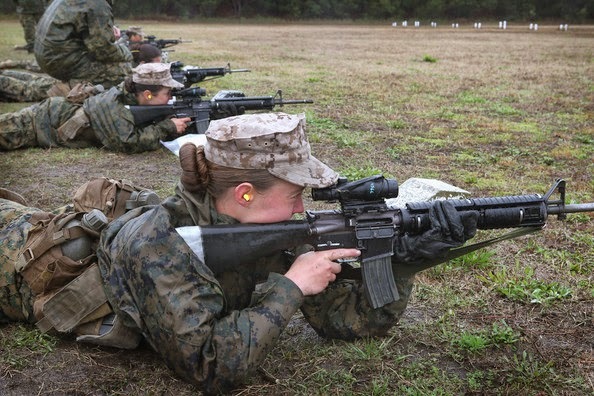 Many arrive at Boot Camp with poor habits in using a rifle which makes the DI's job more difficult and requires an additional level of instruction. On record day, his chances of achieving a high score are as good as any other Boot, thanks to the DI recognizing any problems and making suitable corrections. 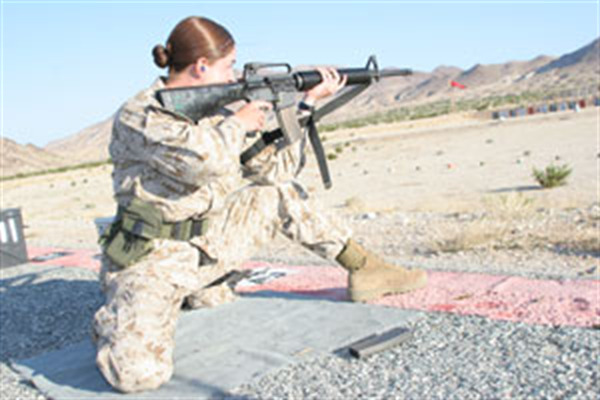 In the photo at left, the woman Boot is using the rifle sling on what appears to be a modified form of the seated position probably on the 200 meter range. The rifle in this photo is today's modern weapon and not the Springfield. attempt to advance on Paris. It was the German Army who tagged the Marines with the title of Devil Dogs. He then is moved to a section of the rifle range, called the 1,000 inch range reserved for firing a .22 caliber rifle on an abbreviated course. Any- one who has fired a rifle at a circus or carnival will immediately recognized the similarity of the 1,000 inch rifle. 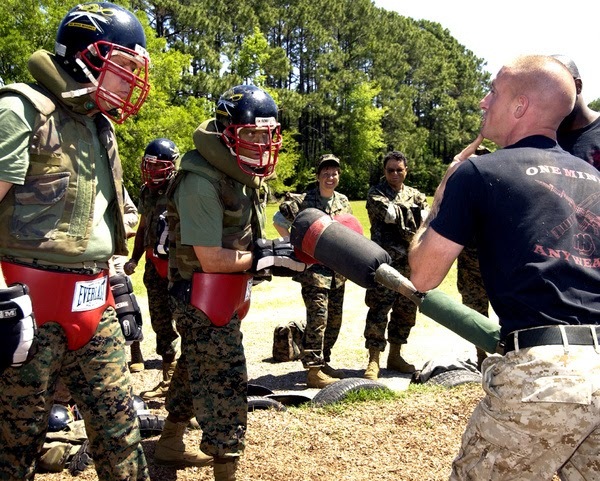 In a brief training session, the Boot is introduced to recoil and the handling of live ammunition. The day finally comes when the platoon is moved up to the live firing range for indoctrination. The Boot platoon is moved to the 200 meter range where the DI may give some last minute instructions based on his personal knowledge of the Boot's ability. The DI will break-down a 5-round clip of .30 caliber ammunition and hand one round to the Boot with instructions to await further instructions. The senior rifle range DI will advise Stand by, wait until all Boots have received their round, then command: Load and lock! The Boot will insert the single round into the rifle's chamber under the watchful eye of the DI and lock his piece. After an appropriate wait, the senior DI will order Ready on the left, ready on the right. All ready on the firing line. When he has satisfied himself that the line is ready, he will order Commence firing! The firing line of Boots would fire their one round and open the bolt of their rifle as a safety measure. The Boots manning the butts would notify the firing line, through the use of wands, where the round struck the target and the DI would review the shot with the Boot. This routine would be repeated four additional times for indoctrination and review of results. prone and sitting with both slow fire and rapid fire as had been done at the 200 meter range. The last range is 500 meters, or approximately 1/3 mile, where all firing is prone slow fire. and fires for record which becomes his official firing record. 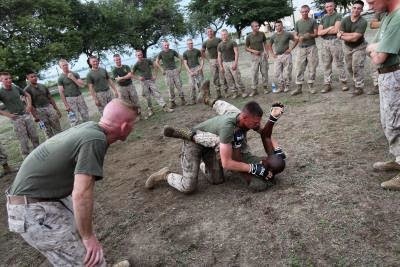 Then the Crucible: 54 hours of incredibly difficult tasks which a Boot must pass successfully to be- come a Marine. 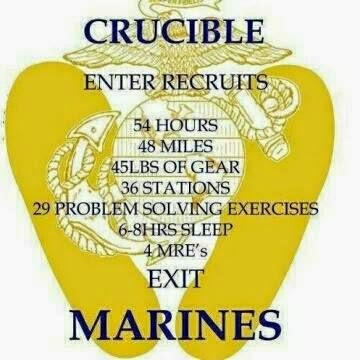 Once again, if he fails, he will drop back one platoon and be required to repeat the full Crucible program. The incentive to pass is so great that very few Boots repeat. 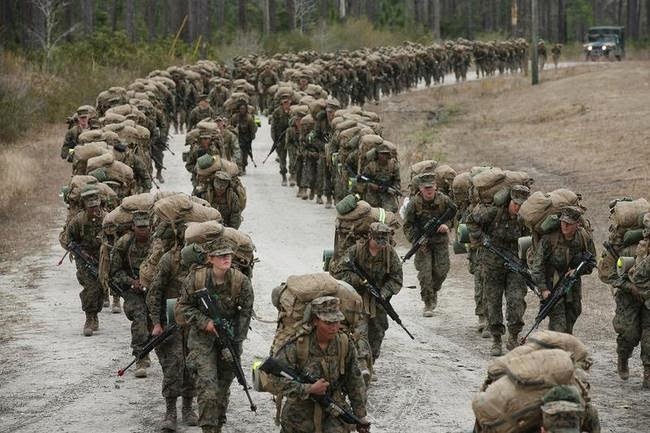 The Crucible is followed by a 9-mile hike to the main training station and preparation for graduation where parents and visitors will be permitted. Final inspections, a march before an audience of senior officers and civilians and the issuance of the Marine Eagle, Globe and Anchor to each Marine concludes the ceremony. In the South Atlantic Ocean there are a number of islands which are possessions of the United Kingdom. Among those are the South Sandwich Islands and the Island of South Georgia. Farther to the west and about 450 miles southeast of Argentina are the Falkland Islands. These islands have been a possession of the United Kingdom for hundreds of years. South Georgia was originally used as a whaling station when whales were hunted for their oil and bones. Now it’s mostly tourism that locals support. The South Sandwich Islands are another matter. The three most northerly of the islands had supported whaling along with South Georgia through the 18th century, but even the hardy whaler crews couldn’t accept the weather and left to hunt their whales elsewhere. The islands are surrounded by pack ice for eight to twelve months of the year and are subjected to extreme temperatures and winds for most of the year. Penguins and seals are permanent residents, but suffer from the pounding waves which drive them against the shaggy cliffs literally beating them to death. Off to the west 450 miles from the coast of Argentina, are the Falkland Islands. Living conditions are more acceptable in the Falklands and Britain has had a sizable population on the islands for many years raising mostly sheep for their wool and mutton. But always in the background was the Argentine claim that the islands were properly theirs. Before 1982 these claims were always in the form of an attempt by Argentina to negotiate a treaty between the British and the Argentines, but the British would have none of it which undoubtedly irritated Argentina. In 1982 the pot boiled over and Argentina invaded and took possession of the Falkland Islands. It is easy to speculate that the thousands of miles of ocean between the Falklands and the British Isles entered into the decision as well as the fact that British sea power had deteriorated significantly since World War-II. Never-the-less, Britain organized a battle fleet which sailed for Ascension Island where it split into two smaller fleets: The first, the battle fleet, continued toward the Falklands; the second, the support fleet, changed course toward South Georgia with instructions to establish a support base. Unknown to Argentina, the British requested the assistance of the United States in a logistics, non-combat role which the United States agreed to furnish. While the British fleet approached the Falklands, the United States rearranged its satellites and moved one to monitor the activities of the Argentine Army and Navy. Specialty, non-combat aircraft supported by tanker aircraft provided information in real-time to the British fleet. When the battle fleet arrived at the islands, landing parties entered the strait between the East and West Falkland Islands and landed in force on the East Falkland Island where it successfully engaged the resident Argentine army. 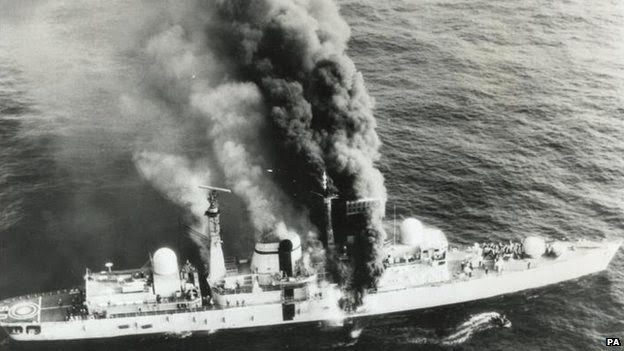 Both the British and Argentine fleets conducted some maneuvering which ended when an Argentine plane fired two French Exocet missiles at a destroyer, the HMS Sheffield. One missile missed and the second struck the vessel amidships, but did not explode. 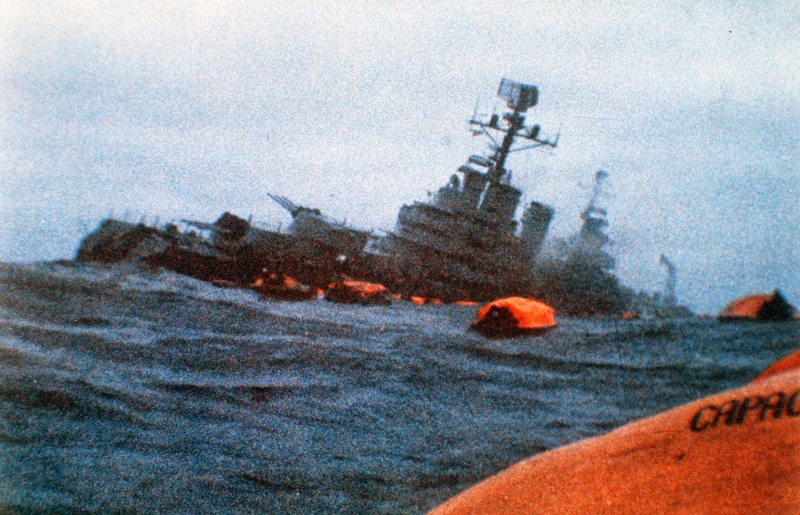 However, it did sever some fuel lines which caused a severe fire, eventually causing the ship to sink..
Concurrently, the Argentine Navy moved their flagship, a heavy cruiser named Belgrado, from its home port in Argentina to an area west of the Falklands. Dual reports were made on its location by a British submarine and an American satellite. The submarine was authorized to attack and sank the Belgrado by torpedoes with heavy loss of life. In post-war discussions, Argentina repeatedly claimed that Britain had agreed the Belgrado free passage in the waters west of the islands without fear of attack. The British deny any such agreement. The British support fleet reached South Georgia, but before any shore installations of substance were completed, the war was over. If you were to look for a word that would best describe South Georgia, “contrast” would be a good beginning. This magnificent South Atlantic island is certainly full of odd comparisons. South Georgia is one of the most isolated inhabited places in the world. It’s 800 miles from the Falkland Islands, east of Tierra del Fuego and the southernmost tip of South America. On occasion it is blocked off by ice. In 1982, however, it took part in a very nasty little war. The island has some of the world’s most spectacular mountain and glacier scenery, and is home to huge numbers of animals. Yet one writer sadly described it as a “slum of the South Atlantic” because of the squalor in which its whaler inhabitants lived. There’s no contrast about the island of South Georgia itself. It’s a wilderness of precipitous mountains and snowfields that can rise to over 8,000 feet within a few miles of the fjord-indented coastline. Its deceptively small – about 85 miles long by about 10-15 miles wide – but so rugged that only a few souls have ever crossed it. There’s only enough flat land to accommodate the occasional whaling station. An airstrip has never been built because of the lack of suitable space. The land abounds with colonies of fur seals. Walk through one of these herds, and you’d be well advised to carry an oar or long pole for protection. 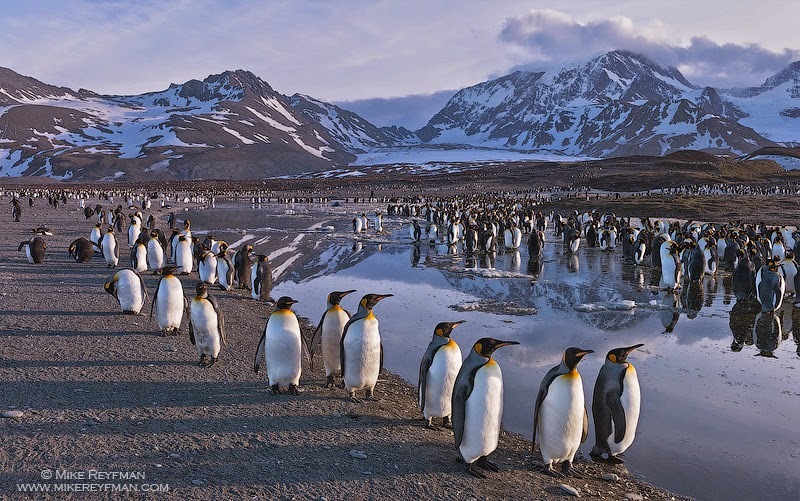 Penguins (Kings, Gentoos, rockhoppers and other species) are found by the hundreds of thousands. The waters off South Georgia were once one of the great whaling grounds. It was the playground of blue, sperm and fin whales. Only a few of these creatures remain today. Because of its location, South Georgia was unknown to the early Spanish and English explorers. It was first seen in 1675. The first exploration was made by Captain James Cook in 1775. Once the island’s animal attractions were known, the hunters soon followed. 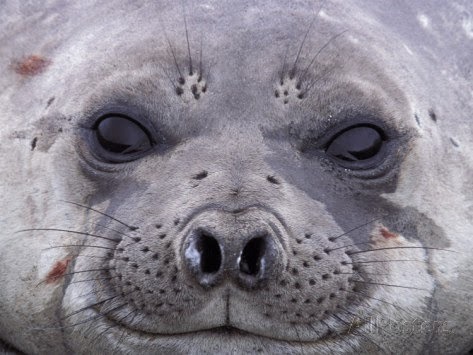 The sealers came first, followed in the late 1800s by the first whalers. In the early 1900s it became economically feasible to establish shore-whaling stations where crews could live year-round. These primitive, foul-smelling charnel houses housed over a thousand men at times. Most of the men were Norwegians: the companies that employed them were Norwegian, Scottish, English or even Argentine. There were very few women; they were nurses, or the wives of whaling company owners or Falkland’s government officials. The stations were established at sheltered spots among the fjords. 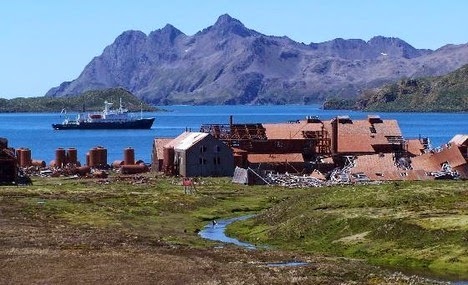 They were called Prince Olaf Harbor, Leith Harbor, Grytviken, Stromness and Husvik, to name the major sites. Huge factory ships such as Southern Venturer, Southern Harvester, Sir James Clark Ross and many others hunted the ocean around the island, using fleets of small, fast whale-catchers. The whale carcasses would be dragged aboard the ships or taken to the stations. Once on great open platforms, they were butchered. The meat was considered a delicacy in Japan, and the oil was of very fine quality. By 1909 enough whalers spent the summer ashore to justify the opening of a post office. 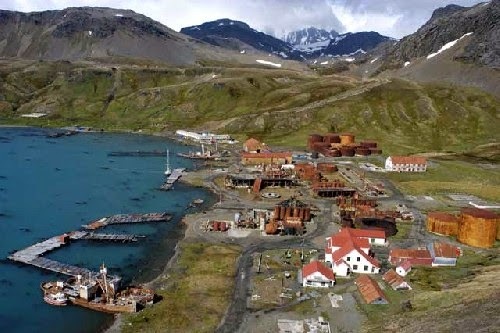 The site of the office was on a sand spit named King Edward Point, within walking distance of the whaling station at Grytviken. This also became the government headquarters, with several buildings housing officials and their families. Providing postal service (or getting it) was no easy task on South Georgia. There was only the single post office at King Edward Point. Whalemen from Grytviken could reach it, but only rough tracks or the occasional vessel connected the other stations. The whaling stations had postboxes where mail could be placed pending dispatch. Sometimes trekkers or ship captains would take the mail; occasionally, the postmaster would visit the stations. Once dispatched, the mail was carried to the Falkland Islands, then on to South America or Europe. Occasionally, a factory ship would head directly to Europe. There were times when it was easier to send a letter to Europe than to the Falklands. Of course, such delivery was much less common during the southern winter. It was common for whalers to write many letters and number them, never knowing for sure which letter would reach home first or when. By the early 1960s, whaling was finished and the shore stations were abandoned. A small group of scientists lived at Shackleton House at King Edward Point, but the whale-men were no more. During this period, the population rarely exceeded 20 to 30 scientists. 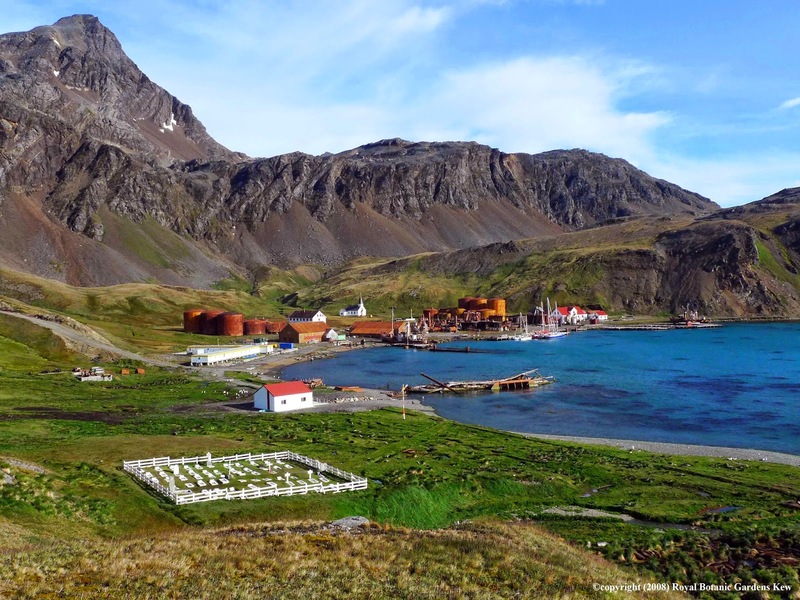 Besides Shackleton house, there was a small base at Bird Island, as well as occasional field parties. There were several expeditions from other countries, and increasing visits from tourist vessels. In 1980 there was yet another name change – back again to Falkland Islands Dependencies. This time, however, the F.I.D. referred to South Georgia and the South Sandwich Islands. The reason for the latter region’s inclusion is rather strange. Britain maintains a claim to those islands, but has never operated a base there. Since there is no postal service, the use of the South Sandwich name must be attributed to the British desire that other nations recognize their land claim. Argentina has long maintained a claim to South Georgia. On April 3, 1982,when Argentina military forces attacked the Falkland Islands, they also attacked a small British unit at King Edward Point. During the hostilities the postmaster, Robert Headland, dumped many postal effects into the bay to avoid them being captured. After being captured himself, he was able to secretly transport a small number of letters back to England when he was released. The Argentine occupation was brief. By April 25, 1982, British forces retook the island. South Georgia has seen many changes since 1982. In addition to the civilians, a military garrison was established, usually numbering several hundred. Because of South Georgia’s harsh climate, troops are rotated three or four times a year. Officers of these units often performed multiple duties while stationed in South Georgia. In 1987, for example, Major G. Howard of the Royal Irish Rangers was Officer Commanding Troops South Georgia, Magistrate, Deputy Postmaster, Customs and Immigration Officer and Queens Harbour Master. Ernest Shackleton’s epic journey from Elephant Island in the South Shetlands, across the Scotia Sea, then overland across South Georgia, has been immortalized in two sets of stamps from 1972 showing Shackleton and his route including the trek across the mountains and illustrations of his companions. Territorial claims have sometimes played a role in the issuance of South Georgia stamps. The Falkland Islands Dependencies definitives of 1946 show maps of all the areas claimed by Britain. The claim on the South Sandwich Islands has been bolstered by several stamps in the F.I.D. 1980 set. It is doubtful that South Georgia will ever have the population it once had. That’s probably a good thing, considering the island’s growing value as a wildlife preserve and tourist destination. As long as Britain thinks it is strategically important to maintain a presence in the far South Atlantic, stamps will continue to be issued. Pendleton, Steve. Excerpts from an article prepared for the Scott Stamp Monthly, July 2004 issue. The Record newspaper reports on the Falklands War, 1982. Historical records of the Shackleton Expedition rescue from Elephant Island. Excerpts. Date? Photos are from the Internet.